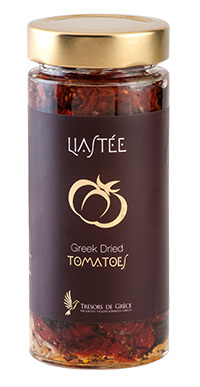 is the Greek word for “sun-dried”. It is pronounced LEE-a-stÉE. carefully selected tomatoes, are manually sliced, stretched and naturally dried under the radiant Greek sun (ancient god Helios”). juicy (not too dry or too “chewy”), surprisingly tasty and “balanced” (not too sour or too salty), made with a “secret” family recipe. as a starter on traditional Greek bread-crackers (“paximadia” from Crete or Kythira). Slice them in all green salads. Use them as topping on pizzas. Make fantastic pasta: slice them on plain spaghetti ; add grated cheese and fresh ground pepper. additives, preservatives or artificial flavours.